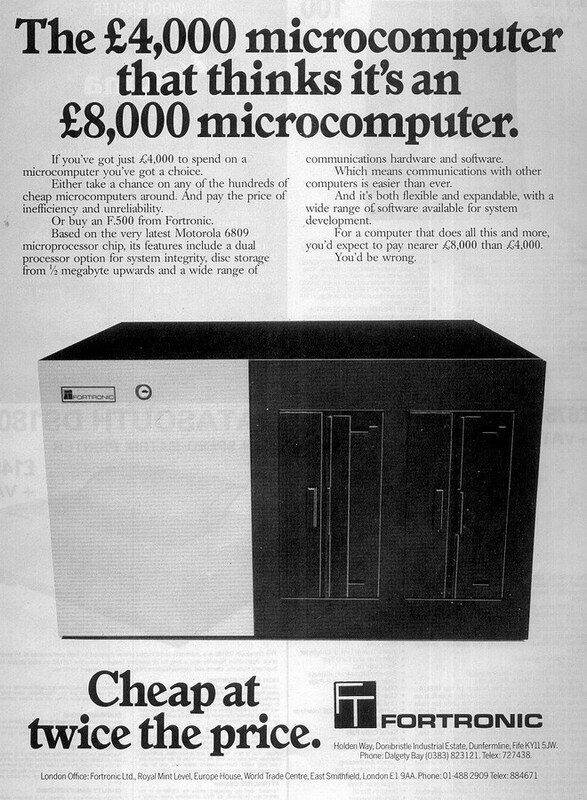 This advert seems to be treading somewhat risky ground with its assertion that somehow £4,000 (about £16,300 in 2019 money) is actually cheap for a micro, when something like the top-of-the-range Commodore PET was available for around a quarter of the price. Proof perhaps that some companies still hung on to the concept that enough people will still pay over the odds on the assumption that it's much better quality - an approach which certainly worked for Apple and IBM. The F500 featured an 8-bit Motorola 6809 (an evolution of the 6800) and disk storage of 500K upwards. Fortronic, a company based in Dunfirmline, Fife and which specialised in banking and financial terminal systems (hence the steep prices) was bought out by banknote printers De La Rue in 1987, for around £7 million.